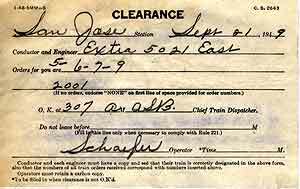 Southern Pacific clearance forms varied over the years, and these examples are shown in reduced size, but in relative proportion to each other. 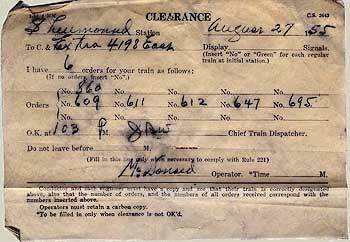 While SP train orders generally were typed, clearances were almost always hand written. 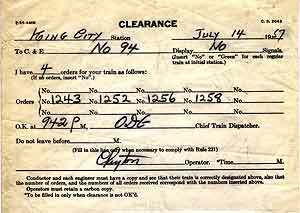 Peculiarly, if a train crew receives a set of orders delivered by another crew in mid-route, no clearance is attached, and there is no requirement for a list of said orders. Wise dispatchers nevertheless placed a list within one of the train orders. 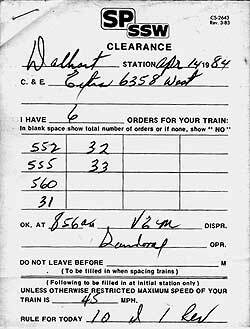 Note in the train order below that both the delivering party's identification (Extra 2353 West) and the recipient's (Extra 1491 West) approximate location are listed in the address of the order. SP used this style of clearance in the post WWII period; size: 51/2x33/8. The road engine, 4-10-2 #5021, ought to be known by many of you as one of he two three cylinder Baldwins still extant. Another post-WWII clearance; Hollister, CA; size: as at top. Extra Motor 03 West; Our guess is that the 03 was a weed sprayer. After SP discontinued the use of classification lights in 1983, the "Display___Sinals line was superfluous. Dalhart, TX (SSW, ex-CRI&P); size: 4.5x6. If a train order office holds no orders for a train, and that train has already passed the last preceding TO office before the clearance is completed, the operator may hoop up a clearance stating that 'I HAVE NO ORDERS FOR YOUR TRAIN'. 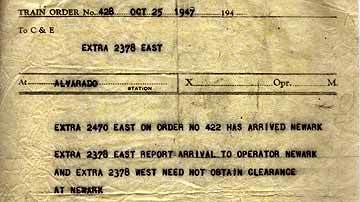 Otherwise, the dispatcher coan issue a train order for delivery at a prior station, as above, relieving the crew of the responsibility. In Newark's case, this would score the dispatcher points with the operator, since Newark 'Tower' (actually only one story) was situated on a long-waik-in-the-rain from the Mulford Main train order post. Occasionally, a crew member would miss catching a clearance-without-orders. 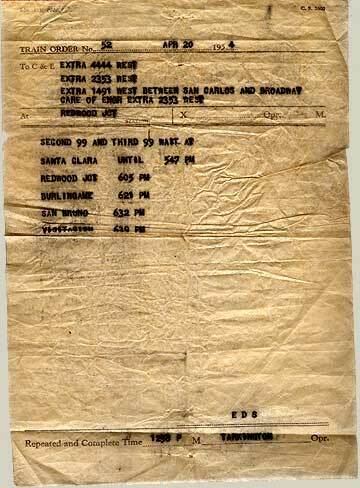 A cryptic radio message to the tower operator, like "Bill, would you take care of that?" usually took care of matters without stopping the train - if the operator liked you. 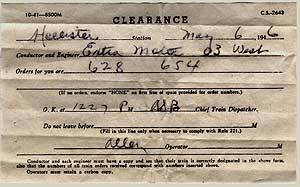 This clearance includes a line stating 'Display NO Signals' - indeed, after this date there would be NO train, since this was the last run of the eastbound Starlight; size 6.75x4.75. Note that, because this is an extra train, nothing is written in the Display____Signals line. The Shellmound TO office was located at MP 7, timetable east of Oakland on the 'Cal-P'; size: 63/4x47/8.